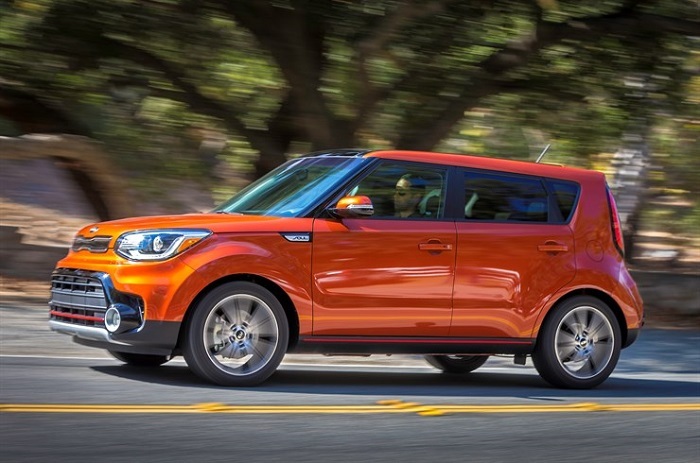 The Hyundai Veloster and Kia Soul have a lot in common. They’re compact, they have hatchback rear doors, they’re quirky, and they’re built by sibling brands Hyundai and Kia. And the newest Soul, the Soul Turbo, could pose a sales threat to the Veloster. That’s because the Soul Turbo uses the same engine that’s offered in the Veloster to get a power bump, up to 201 horsepower. Of course, one thing the Veloster has that the Soul Turbo doesn’t is an available manual transmission, and that may make a difference to some enthusiast buyers. The biggest problem for the Veloster is that this generation is on its way out, so some buyers might gravitate towards the new for 2017 Soul Turbo, while others will wait for the next Veloster to arrive. On the other hand, as quirky as the boxy Soul Turbo is, it’s still has a traditional four-door layout, while the Veloster has the unique three-door setup. The Veloster should still register as the sportier buy of the two, at least to most buyers, because of its character – it looks and drives a bit more like a sports car than the boxy Soul. But with the same engine now available in the Soul, some buyers may gravitate to it. The natural pecking order will be restored in a year or two, however, when the next Veloster launches. Until then, beware stoplight drag races with the Soul Turbo. The Worldwide Car Battery Shortage and is Your New Car Order Affected?